The Salt Edge Compliance Solution takes care of initial verification, onboarding, and communication with TPPs, overtaking this burden from the bank's side. Salt Edge conducts the initial check of the TPP's license validity, by scanning the online registers of the national regulator and verifying the passporting permission. The Salt Edge Solution provides AISPs and PISPs with a well-documented API, testing facilities, a list of Demo Providers, and examples in different programming languages in order to ensure a seamless integration process. TPPs get access to a complete testing environment to explore the Salt Edge Solution through a dedicated dashboard. The Compliance Solution also provides support services to AISPs and PISPs going through the API onboarding process, thus reducing the friction between the bank and TPPs. The Authenticator App has been developed to handle "Dynamic Linking" and to meet the Strong Customer Authentication (SCA) requirements. The Authenticator is a stand-alone app, which has been implemented as a Decoupled SCA model. It allows TPP linking to end-customer bank accounts and authorization of payments initiated through PISP app. Such implementation allows the end-customer and the bank to be fully in control of TPP actions. The Authenticator can be white-labeled and added as a separate banking app, or integrated within an already existing one. 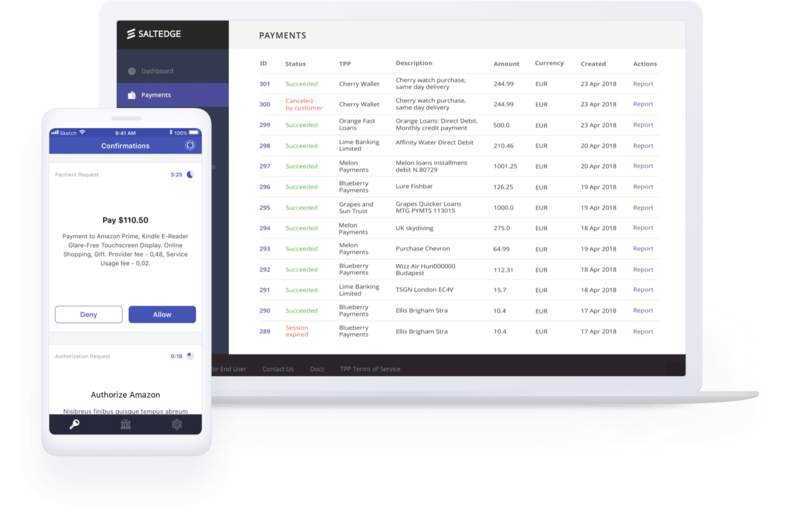 The Salt Edge Compliance solves the issue of Consent Management for banks, by ensuring a unified and real-time exchange of the end-customer’s consents between the bank and TPP. 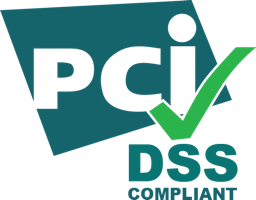 This ensures PSD2 compliance for Banks and TPPs. The end-customer can manage his consents at any given time via a provided dashboard. If and when an end-customer decides to revoke the TPP access, Salt Edge notifies the bank and the TPP. Once the consent is revoked, the TPP immediately loses access to the end-customer's data, as well as the ability to initiate payments on his behalf. The Salt Edge Compliance Solution supports all the exemptions mentioned in the Regulatory Technical Standards on SCA. 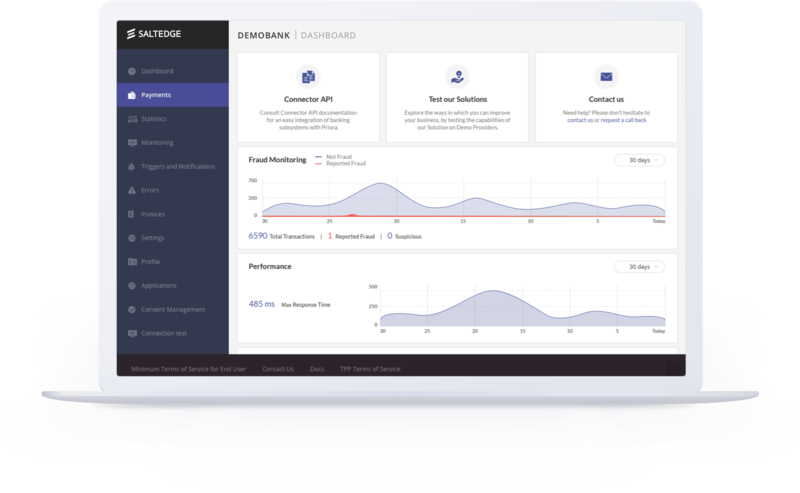 The Salt Edge Compliance comes with a set of dashboards for banks, TPPs, and end-customers. The most comprehensive functionality is present in the bank’s Dashboard, which enables the managers to be in full control of the system: monitor the latest activity of TPPs and end-customers that are using such third parties. 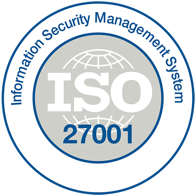 They can also manage consents, exemptions, trusted beneficiaries list, incident reporting, etc. Salt Edge Compliance is a Software as a Service, which means it is cost-effective, reliable, and requires minimum technical participation from the bank. The system maintenance, monitoring, and updates are handled by Salt Edge. 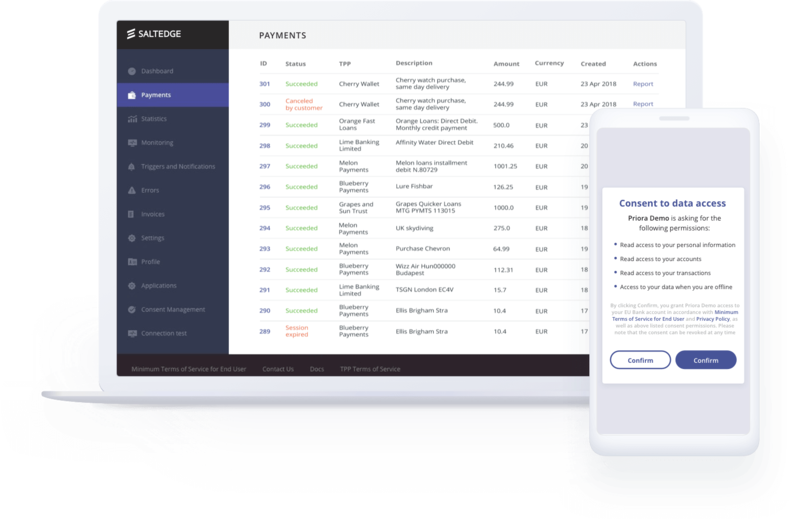 The Solution connects to the core banking through a Connector API and delivers a unified and fully PSD2 compliant API gateway, accessible to authorized TPPs. The Connector is run entirely by the bank and is delivered in a set of documentations, APIs, testing suites, and implementation examples, which ensures a seamless connection with banking subsystems. Additionally, the Connector is flexible and permits the integration of other modules required by the bank: Anti-Money Laundering (AML), fraud monitoring and prevention, logging, risk analysis, etc. The SaaS distribution model enables a bank to modify its own core banking infrastructure without having to depend on the Salt Edge Solution. 1. The Sandbox environment may be available for TPP testing in two weeks. 2. While the Live environment will be available for production use by TPP in only two months. Contact us today and we will help you deliver the dedicated channel in advance of the deadline set by PSD2. Salt Edge Compliance acts as a firewall between the bank and TPPs, by preventing any mass breaches. The solution handles maintenance and updates of the communication channels between the bank and the TPPs. In accordance with PSD2, banks must provide the same availability of the dedicated interface as for end-customers facing interfaces.